Hey Connie, I like collards–especially when someone else goes to the trouble of cooking them–but I adore the peppery tang of mustard greens, which are a snap to prepare. My favorite way to cook them is to saute the chopped greens in olive oil with hot pepper flakes and chopped garlic for a few minutes. Eat as is, or sprinkle with parmesan or feta cheese. Sometimes I toss the sauteed greens with cooked pasta and a little more olive oil. Sometimes I add kalamata olives. And sometimes I saute onions and mushrooms first, then add the garlic and hot pepper flakes, then the greens, and finally toss it all with pasta and cheese. Maybe we should have a greens theme for our annual Duke friends reunion, yes? Absolutely! 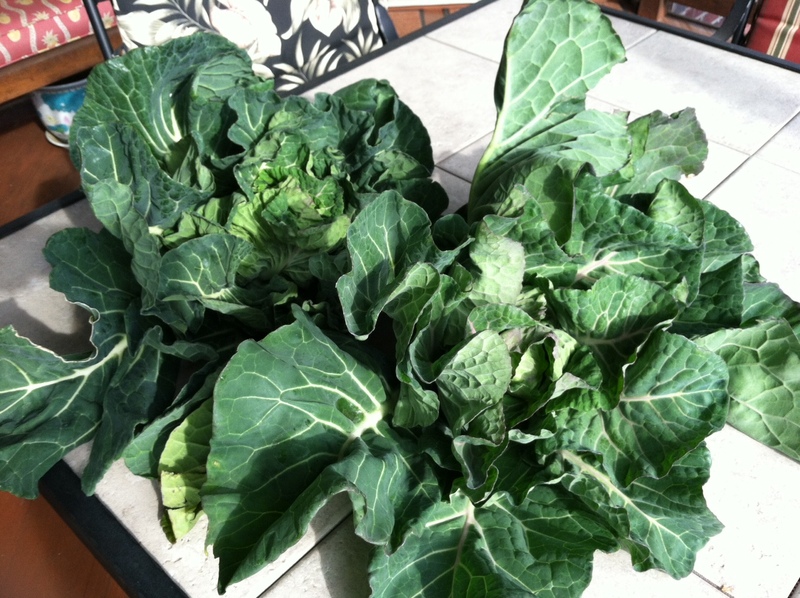 Maybe we’ll go with the mustard greens; we did collards once before. I think some cheese grits or cornbread would have to be part of the menu too! Yum. Connie, I am liking your post, but I have never liked greens. I’ve tried, but they are always bitter. I even ordered them at Cracker Barrel once thinking surely they would be good there, but I was disappointed. Are they an acquired taste? Or is it all in the cooking? For me, they have definitely been an acquired taste. We did not eat them growing up so I’ve had to make an effort. I did it because I was trying to up the vegetable intake. I teach a lot of nutrition classes and needed to walk the talk. The Boozy Braised Greens have enough other flavors going in the pot to get rid of the bitterness and that’s been helpful for me. But there are plenty of other green vegetables out there and life is short! The Versatile Blogger Award awaits you at my place. I like greens, but don’t think that I’ve ever tried collards. I’ll have to look for them at the store. Sheryl, you can find them precut in bags, but those tend to include the very tough centers. They are better fresh, even though it’s more work. You can then cut the leaves in halves or thirds, long ways, followed by rolling them and cutting in thin ribbons. Good luck! Thanks for the tips.I don’t mind cutting up my own vegetables.